Popping up here and there seemingly as soon as you turn away, dandelion persists and as it grows bigger, it’s large taproot becomes many a gardener’s foe. With a slight change in perspective, however, gardeners could expand their yield and embrace the ever persistent pioneer plant: dandelion. First, why does dandelion pop up so quickly in the garden? There are two key reasons you may find yourself battling dandelion in your garden: 1. It is trying to stabilize and cover the disturbed and exposed soil in an attempt to restore and rebuild fertility, 2. It’s deep taproot serves as a nutrient accumulator, where it pulls nutrients from deeper in the soil and brings them to the surface for other plants and microbial life to use. Why does this happen? Conventional lawns and gardens mimic immature ecosystems and as a result, are usually dominated by early succession plants. In the words of permaculture designer Toby Hemenway, “The bare earth and disturbed soil in a vegetable garden or under clean-cultivated shrubs sing a siren song to weeds, which eagerly cover naked ground, pull nutrients out of underlying mineral and rock, and prepare the locale for more mature ecosystem such as shrubland and forest. A pure expanse of well-watered grass is aching, in natures scheme, for a blitzkrieg from seedlings and shrubs or, at the very least, a spike in diversity via fast-growing annual weeds.” So, the next time you find dandelion or other weeds in your lawn and/or garden, remember, they are working to diversify the space and help mend the soil that has been disturbed. But for the gardener, it gets better than just understanding dandelion’s role in the succession of soil because many parts of dandelion are not just edible, but delicious! The common weed has been used for centuries in traditional medicine practices worldwide, as a restorative tonic, edible food, and in herbal wines and beers. Dandelion is extremely versatile in the kitchen and can add zip to any meal. Buds and leaves are best when picked young. The leaves are edible both raw and cooked; try them tossed in your favorite stir-fry, salad, or soup. Flowers are great frittered or used in dandelion wine, while the roots are often steeped for tea or pickled. Dandelion root tea is a common health supplement used mainly for its mild diuretic properties. When roasted, dandelion root makes for a cleansing, caffeine-free beverage that can serve as a coffee substitute given a mild relation to coffee in taste. And the icing on the cake? Dandelions are chock full of health benefits. They are rich in vitamin-A, C, iron, calcium, detoxifiers and can aid with bone health, liver disorders, diabetes, urinary disorders, skin care, acne, weight loss, cancer, jaundice, gall bladder disorders, anemia, and high blood pressure. So the next time you see dandelion pop up in your garden, don’t just weed it, eat it! For Utah State University Extension Sustainability, this is Roslynn Brain. The snow has barely melted yet Dandelions are pushing their way up through the grass. The flowers delight my daughter who eagerly gathers them by the fistful into cheerful but quickly droopy bouquets. However, not everyone shares her enthusiasm. 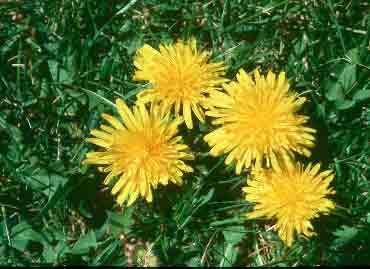 The common dandelion is listed as an invasive and noxious weed by the USDA. Lawnowners spend a lot of time pulling them up and a lot of money on herbicides. There is even a Facebook group called Dandelion Haters United! The Flora of North America recognizes 15 species of dandelion and four of these occur in Utah. Two native species are found in the mountains. The dandelion that you see in your lawn is an immigrant from Eurasia. If it has olive green seeds it the “Common Dandelion”. If it has brick-red seeds and leaves lobed to the tip it is the so called” Red seeded dandelion. “ This red-seeded dandelion is also common. The word dandelion comes from the French dent de lion or “lion’s tooth,” referring to the serrated leaves of the plant. The French however, use another name “pissenlit” (pis’seau-li) or bedwetter, referring to the diuretic properties of the plant. Throughout the ages, people have used dandelions to treat various ailments such as dyspepsia, heartburn, spleen and liver complaints, and hepatitis. Modern pharmacaological studies indicate both dandelion extracts or individual compounds of dandelion leaves or roots really do have significant health-promoting properties. They appear to be especially beneficial for treating digestive disorders, inflammation and as an anti-oxidant. But the main reason you shouldn’t reach for that pesticide is that dandelions are delicious! The young fresh leaves taste great in a salad, or you can sauté them as you would spinach. You can make dandelion soup or even wine. The greens have 50% more vitamin C than tomatoes, double the protein content of eggplant, and twice the fiber of asparagus. They are also rich in potassium and iron. If harvesting from your yard, just make sure you pick the leaves before the flowers appear. In a medium bowl, toss together dandelion greens, red onion, and tomatoes. Season with basil, salt, and pepper.